I had of course heard the buzz around Proud, a new anthology featuring LGBTQ+ stories by LGBTQ+ authors. Many of the authors will already be known to you, but, like with previous similar anthology Stripes, the publishers also solicited submissions from new, as yet unpublished authors, and four are featured here. The standard of stories is so high that I've already forgotten who the unpublished authors were, they're all excellent. I read this book in a couple of days while away last week, and I thoroughly enjoyed it. 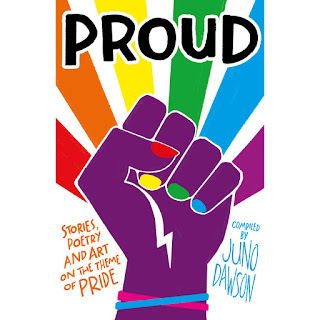 There are all kinds of teenagers here and all kinds of stories - a coming out story, a getting comfortable with yourself story, a coming of age story, a running away story - and all featuring queer teenagers of many types. There's trans kids and lesbians and gay kids and kids who aren't sure where they fit in yet. My favourite ones were the ones by Tanya Byrne, Fox Benwell, and Dean Atta. Dean's is a poem and it's right at the end and it hit me right in the feels. I loved it, I thought it was a perfect ending to the anthology. I loved Tanya's story because it was about music and making friends through music, and I loved Fox's because it was about a fierce warrior and their friends. This is a gorgeous anthology and I will probably buy myself a paper copy when it's out in March. I received a free copy of the ebook but was not otherwise compensated for this review. All thoughts and opinions are my own.